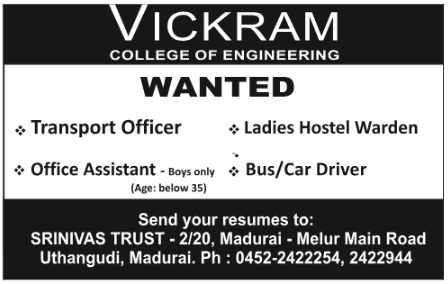 Vickram College of Engineering, Madurai has advertised in the DINAMALAR newspaper for recruitment of Non-Teaching Faculty jobs vacancies. Interested and eligible job aspirants are requested to apply immediately from 20th January 2019. Check out further more details below. About College: Vickram College of Engineering (VICKRAMCE), is founded and managed by engineers. VICKRAMCE is an ISO 9001 certified organization. The college offers holistic education giving equal thrust to professional and personal development. Approved by All India Council for Technical Education, New Delhi and is affiliated to Anna University, Chennai. B.E. in Computer Science and Engineering (CSE), Electronics and Communication Engineering (ECE) and Mechanical Engineering (MECH) Accredited by NBA, New Delhi. The college is located on Madurai Sivagangai Road, about 19 kms from Madurai city limit and 22 kms from Sivagangai city. The college was started in the year 2001, at present, there are about 1600 students from across the length and breadth of the country pursuing engineering under various departments.